Arch Address Number Lawn Plaque - - personalized lawn sign. Thick rope border and seashell accents. Includes lawn stakes. Made in USA. Perfect for coastal locations such as beach houses, lake resorts, and marinas. Intricate rope border highlights the arch shape. Holds up to five 4.5" address numbers. Colors: AB antique brass, AC antique copper, BG black/gold, BV bronze verde, OB oil rubbed bronze, OG bronze/gold, PS pewter/silver, GG green/gold, RG red/gold, BS black/silver, BW black/white, WG white/gold. Large image color is pewter/silver. Smaller images (from left to right) are antique brass, antique copper, black/gold, bronze verde, oil rubbed bronze, bronze/gold, pewter/silver, green/gold, red/gold, black/silver, black/white, white/gold. Manufactured from cast, high-density aluminum alloy. Protected by Alumi-Shield™ all weather coating. Alumi-Shield™ protects against harsh weather and environmental elements and extends the product life. Dimensions (sign only): 15.5"W x 10"H x .375"; weighs 5.6 pounds. 18" lawn stakes. 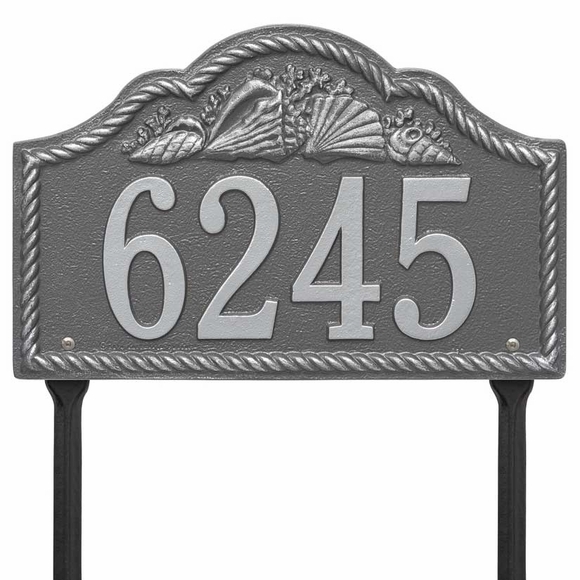 Arch Address Number Lawn Plaque perfect for coastal locations such as beach houses, lake resorts, and marinas.